Over the years there has been a growing trend to travel to a few destinations on a single holiday. Greece ranks as one of the top countries to visit in Europe while islands like Bali and Maldives in Asia are the ultimate honeymoon destinations. Luxurious hotels, flavourful local cuisine and breathtaking views, are just some of the best reasons to book your next flight and visit two continents in one holiday. Flights take-up a great part of a travel budget, this is why careful planning can help you make the most of your holiday and to eliminate unnecessary travel costs. The first question that you should address is — when is the best time to travel to Europe and Asia? 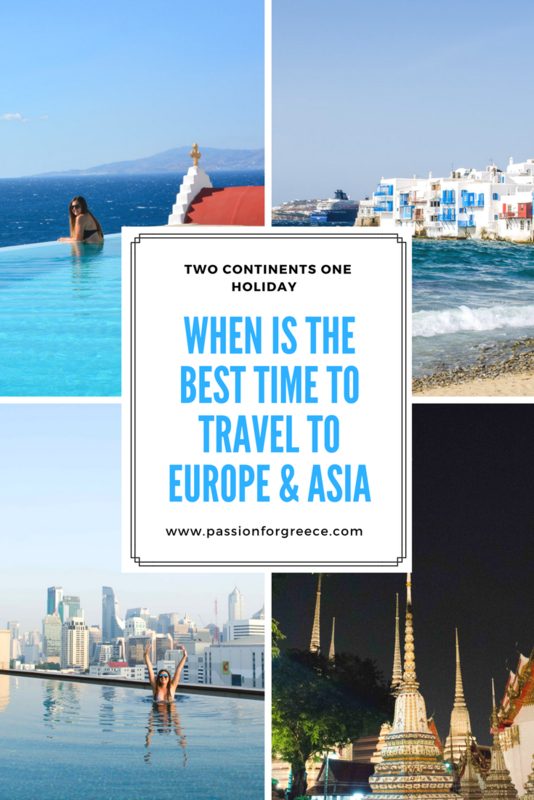 When is the best time to travel to Greece? As Greece based local experts we must warn you that traveling to Greece in August is not the best idea if you want to travel on a budget and also to skip the crowds. August is the holiday month when everyone is traveling around Europe and when most of the Greeks take their annual leave. If you want to visit Mykonos or Santorini the best time to fly there is in May, June or September. We are not saying that you may not find a travel deal during the months of high-season but this is not a given. You may for example find a cheaper early-morning flight but then again you must be flexible with your travel itinerary. For those who only have a few weeks of holiday, will usually prefer to plan their trip in advance. For example on your Greece trip you are planning to spend a total of 7 days and to visit Athens, Mykonos and Santorini. Perhaps you will fly into Athens and immediately head to Mykonos, then Santorini and then spend the last 24 or 48-hours in Athens. Most destinations in Greece are a 30 minute flight away. This is why you can play around with your itinerary. You may also use a ferry boat service to commute between the different Greek islands. Flying can be cheaper if you book your seats in advance. There are many budget carriers around the world. Many of them charter direct flights from most major cities in Europe to the Greek islands during the summer months. Usually the summer season in Greece ends in October, some resorts remain open until the end of October or even beginning of November. You can enjoy a great holiday off-season on Mykonos in early October. Away from the crowds, cruise ships and without breaking the bank. 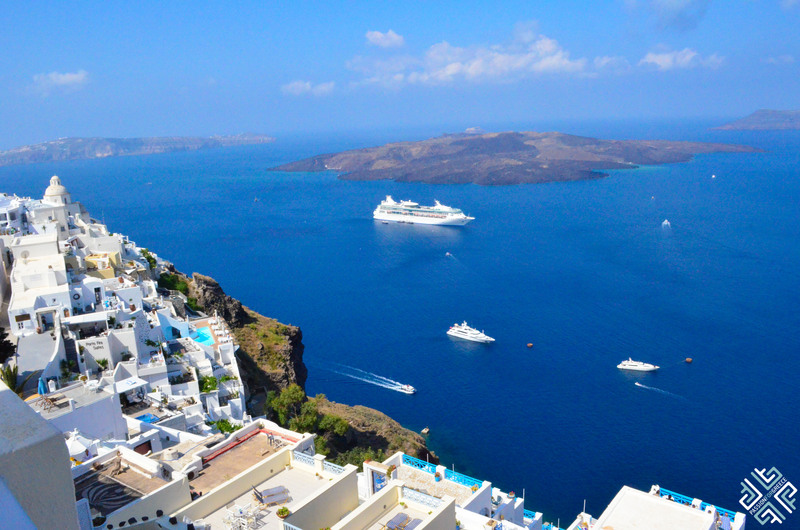 In Greece budget carriers like Ryanair fly to a number of destination: Mykonos and Santorini included. The busiest time of year to visit Asia is usually during Christmas and New Year, this is when everyone flocks away to warmer climates. However, many of the destinations have the ideal climate and prices are cheaper during the months of April to September. Check each destination before you plan your trip to Southeast Asia. Traveloka has amazing flight ticket deals. One of the popular budget carriers in Asia is AirAsia which offers fantastic travel deals. So if you are planning traveling to Europe and Asia on your next holiday I recommend that you start looking at the cheap AirAsia booking promotions today. I also advise you that when you do travel with budget airlines make sure that you follow their baggage allowance rules, otherwise they will take every opportunity to charge you like crazy. On my recent flight with Ryanair from Mykonos to Athens I was charged 62,00 Euro for my cabin sized luggage which I have used on numerous occasions in the past. Try to book your flights as early as possible. Usually three months in advance is a good time, especially if you are going during high season. Which websites do you use to book your flights?